So, I began devouring ALL the blogs, parent support group tips, and eagerly awaited the moment I could begin reading Dr. Christine Roman-Lantzy’s book, Cortical Visual Impairment: An Approach to Assessment and Intervention, as soon as it was in my hands a week later (I also highly recommend the Little Bear Sees book; I easily consumed the entire thing in a single day and the resources listed in the back are well worth purchasing it!). Within days of Rosalie’s diagnosis I knew enough to hunt down a nearby Perkins-Roman Endorsee to get an official, accurate assessment of where Rosalie is at on the CVI Range. But, the appointment was more than a few weeks out and I understood (thanks to all the great resources being produced by Dr. Roman-Lantzy, Perkins School for the Blind, and several parents that are true CVI advocates paving the way for improvements in medical care and educational instruction for our kiddos!) that time is of the essence with CVI. I went ahead and took things into my own hands, because waiting a month to do the CVI Range assessment and eventually meet our state-assigned teacher of the visually impaired (TVI) would mean losing an entire month in which Rosalie could make progress. What did I do? Well, for starters I hit up Michaels, The Dollar Tree, and Amazon using the 10 characteristics of CVI and firsthand knowledge of my daughter. Even though I did not know yet exactly where Rosalie was on the CVI Range, I did know that she is very young and surely in the earlier stages; plus, I figured that the single most important thing was to get her looking. Once I knew her score on the CVI Range I could better tailor things to her exact skills, but it was highly likely she would benefit from all the typical things kids in Phase I of CVI benefit from (and my best educated guess was that she might be late Phase I, mayyyybe early Phase II out of the total 3 phases of CVI). 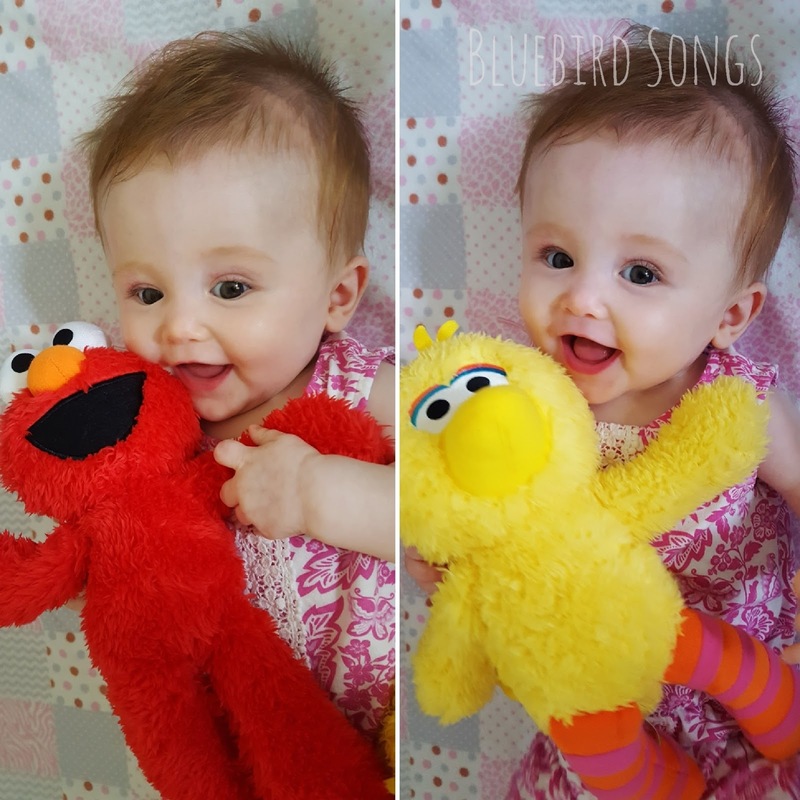 Understanding that red and yellow are often the first colors our eyes can detect (and are nearly always a CVI child’s initial preferred colors), I made sure to get simple, single-colored items but especially red and yellow. Understanding that CVI kids are drawn to lights I purchased little flashlights (for highlighting items I want her to see), light sticks that glow in bright colors, and some LED string lights to hang above one of her play areas. 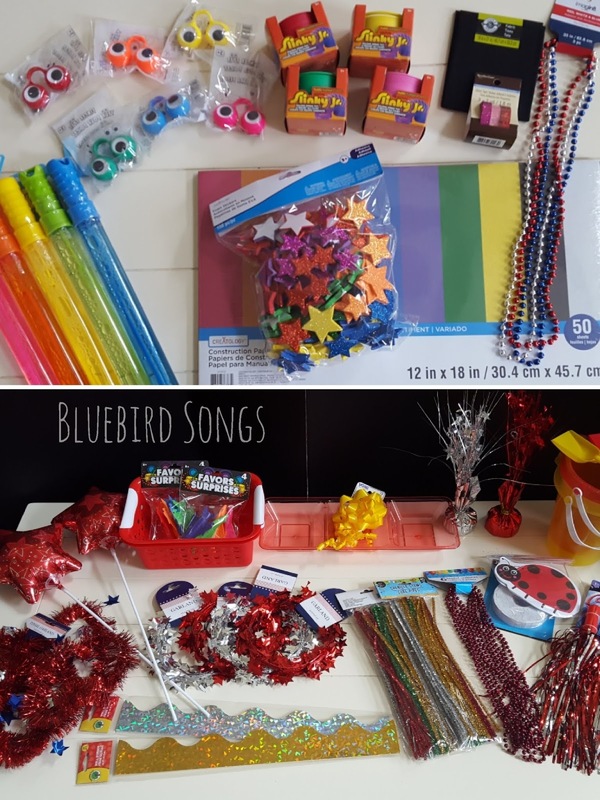 Understanding a CVI child’s typical need for movement to visually attend to things, I stocked up on slinkys and shiny items (because the reflective properties give an impression of movement) like tinsel, shiny garlands of stars, balloons, pom poms, bead necklaces, etc. Thinking ahead, I also got some sparkly foam star-shaped stickers and sparkly washi tape that I intend to stick on everyday items as Rosalie gets bigger and strong enough to sit up and pick things up (like cups, spoons, etc.). 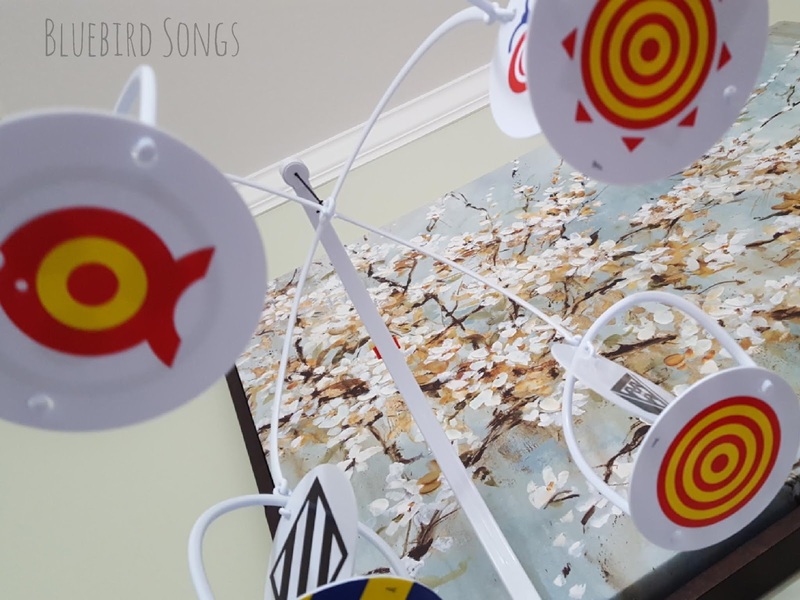 These kinds of tricks can help a child begin to better see their everyday objects. 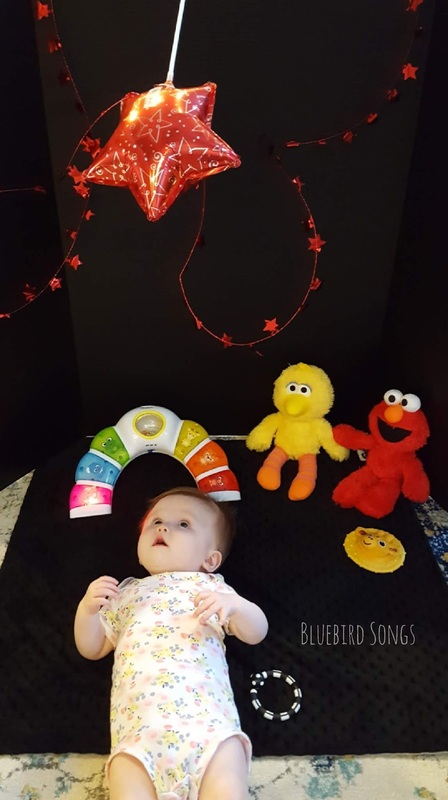 Especially important for a child with CVI is minimizing the complexity of the environment, so I purchased a black baby blanket, black sheets, black fabric squares, and a couple of black “science fair” tri-fold boards that can be used to help her better focus in various places throughout our home. 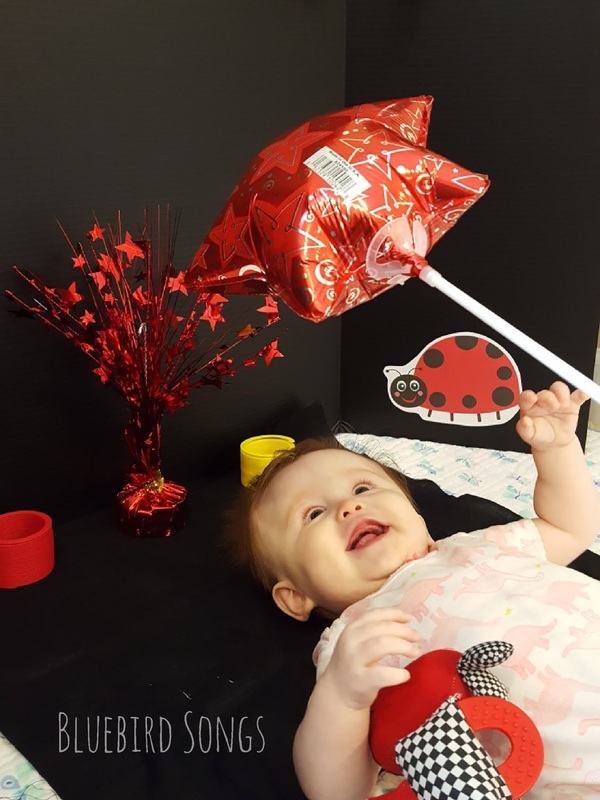 She loves this star balloon and visually tracks it beyond her preferred visual fields! Per Rosalie’s new OT’s recommendation, I found a baby toy that lights up for her to see during tummy time – and I immediately saw an improvement in her tummy time attention-span and duration, which is crucial for building neck strength and head control (the main source of all her PT needs because of her hydrocephalus and being born with a large, heavy head). All of these items can be used whenever Rosalie is awake and playing on the floor, in the play pen, in my arms or lap, etc. 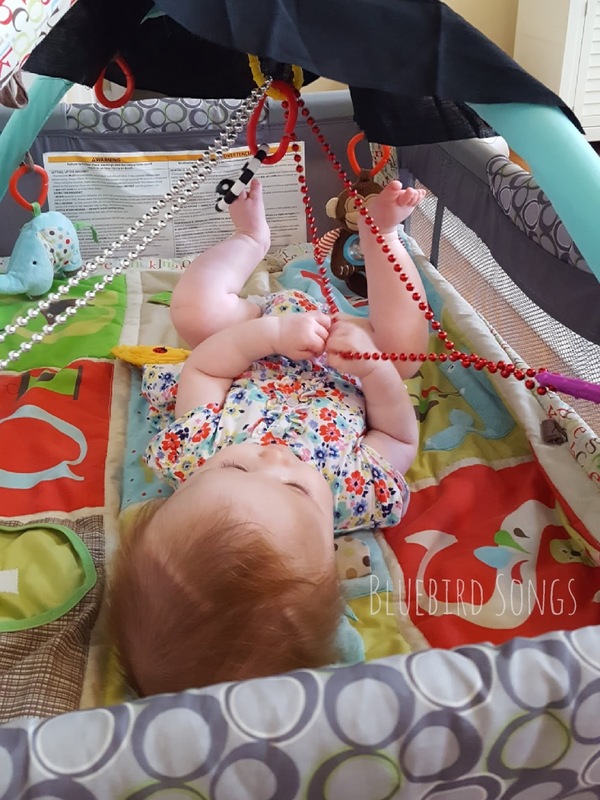 But, the next logical step was to think more wholly about her environment and pinpoint every place she spends any amount of time on a regular basis; I started brainstorming ways to get her to use her vision during meals, diaper changes, when she wakes up in her crib, riding in the car seat and/or stroller, in the bath, etc. I began realizing that Rosalie was probably not using her vision much at all doing things like riding in the car – because there was nothing she could easily see or focus on! 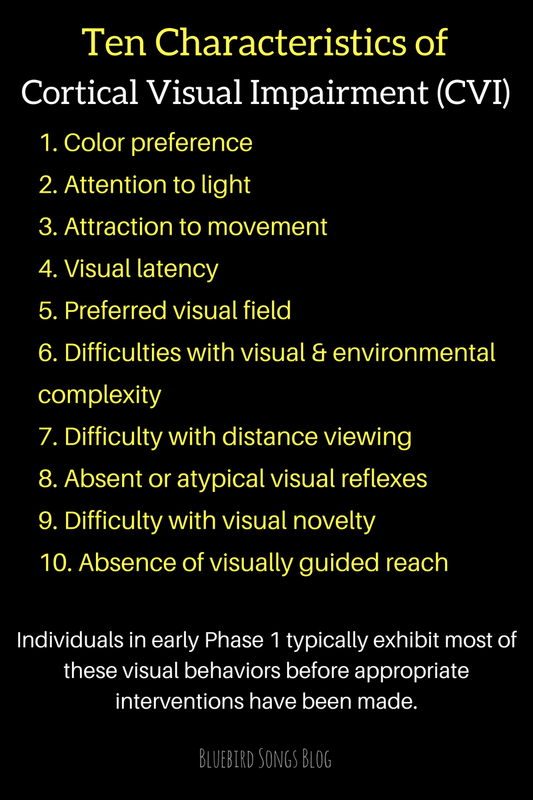 It’s important to understand that a child with CVI will not use their vision in an environment or situation when they are not given anything their brain can make sense of to look at; they will typically have a blank gaze and instead use their other senses (but a child with CVI does not LOOK blind because their eyes work; so it is crucial to remember that even if they appear to be looking that does not mean they are fully seeing). The very first thing I did (even before I purchased all the dollar store items) was to grab a shiny red gift bow from the closet and stick it on the end of her spoon. 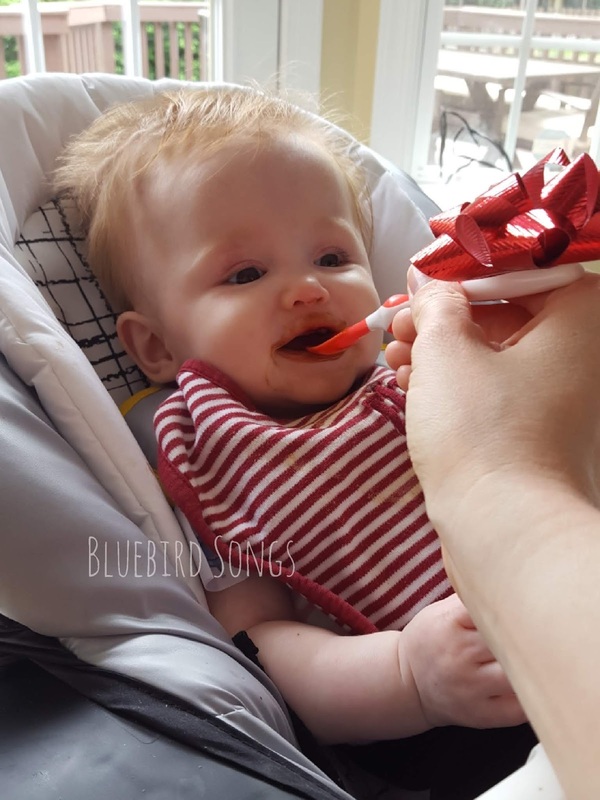 I now use it every single time I feed her in the high chair, and after about a week I saw her sometimes opening her mouth in anticipation of the food when she saw the spoon coming. Prior to consistently adding the bow she never once opened her mouth for the spoon; I would have to gently touch her bottom lip to get her to open her mouth – because (in hindsight it’s pretty obvious) she could not see the spoon coming! This is progress, y’all! In the crib I added a mobile – one that has red and yellow images (her preferred colors). I understand that the images may be too complex/cluttered for her to fully process, but a mobile MOVES, which is a key to simply get her looking. It’s better than nothing! And I have plans to adapt it if need be by covering it with single-colored construction paper and adding pipe cleaners or other shiny objects. 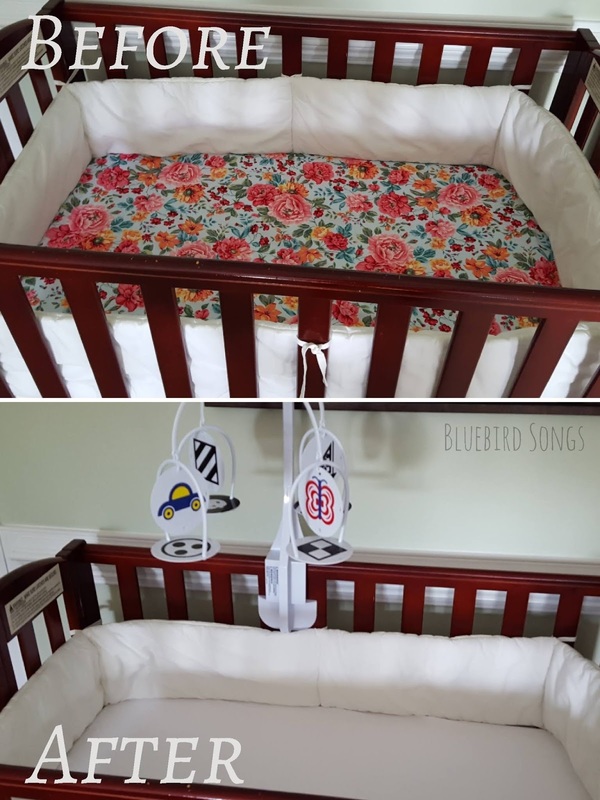 I also purchased an inexpensive white sheet (it only slightly broke my heart to remove her floral one that this boy-mom had custom made from an Etsy shop for my only daughter – but her vision is so much more important than my feelings about a crib sheet!). 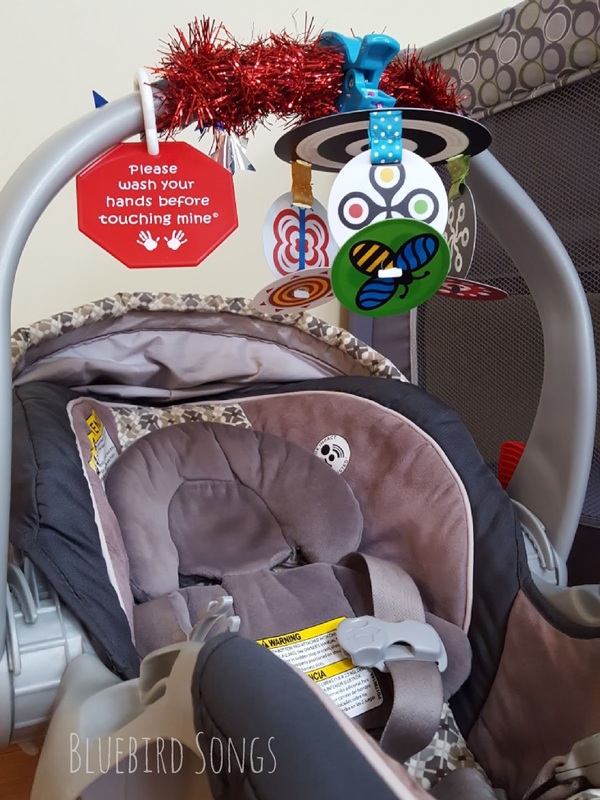 I got the travel version of the same mobile, which easily clips onto a car seat or stroller. Again, the images may be too complex, but it bounces and moves around as she rides so it catches her eye – and I have recently seen her looking and reaching for it! And the list goes on and on. I know that there are many more ways I can adapt her environment, including making improvements to the areas in which I have already started making changes. But, CVI is a visual impairment that can begin improving with even a few, simple, consistent changes. I don’t typically like to start implementing things that are not “perfect” or “completely ready,” but in this case not only did I just start here and there, but I would also encourage other CVI parents to do the same. We’re always going to be finding new ways to adapt something for our daughter, so the work will never be “done.” It’s much better to start small and build our way up as we go than to sit around missing out on little opportunities to allow our children to really see. Lo and behold, when I got Rosalie assessed by a Perkins-Roman endorsee a couple days ago it was confirmed that she is in late Phase I – very close to starting Phase II (UPDATE: once I got the complete written report her final score actually landed her in early Phase II). So, the adaptations I’ve implemented thus far are pretty appropriate and useful for her. 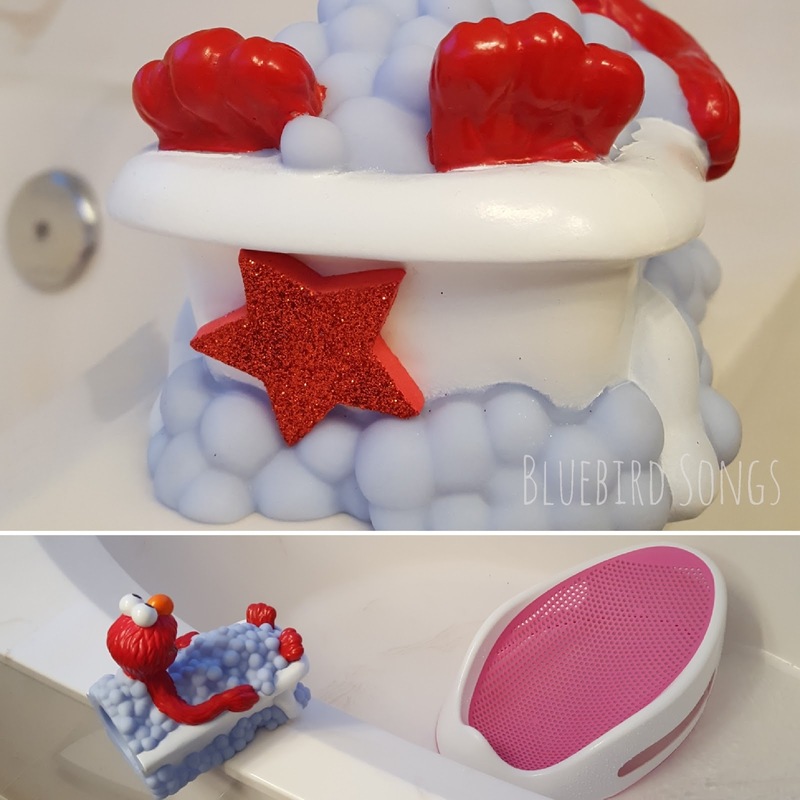 I’m certainly no expert, but for those of you with kiddos in earlier stages of Phase I, I would probably recommend playing with lighting even more. Rosalie is not distracted by natural lighting at this point, but does seem entranced by light-up toys – especially if we dim the lights a bit. I imagine that kids in earlier Phase I might need low lighting as a more regular part of their environmental adaptations. Wherever you’re at, just keep going. Trust me, I know it can feel overwhelming knowing there is so much to DO…but I also find great peace knowing that there is so much we CAN do. It will only get better from here.